"You can tell it's Mattel, it's swell." That commercial catch-phrase was probably the truest statement of the times. 1966 was the year that I acquired this outstanding toy set called Creeple Peeple from Mattel. Let's not forget that Mattel Toys also manufactured some great army toys including the incredible "Tommy Burst" machine gun. I recall the television commercials for these magnificent sets. If memory serves correctly, I believe that Creepy Crawlers was the first of these "Thingmaker" sets from Mattel. After seeing a commercial for Creeple Peeple, I knew I had to have one. Now, this wasn't just another play set; this was an entire manufacturing company in one! This set made toys! There were other sets that followed this similar idea, such as, Tinker Toys, Lincoln Logs, Krazy Ikes and Play Doh. Krazy Ikes and Tinker Toys permitted a kid to branch out, and create different structures and creatures. Play Doh permitted the same, but the Thingmaker manufactured a series of impeccable creatures. The song "Georgy Girl" was playing on the radio the night I went to get my Creeple Peeple set. Whenever I hear that song today, I'm reminded of that time, and the evening that I was about to spend my fortune on this magnificent play set. It seemed like it took forever to save for it, but once I did, the excitement was intense! Remember the smell of the Plastigoop cooking? It was a strange, almost electrical fire smell. You could actually smell the plastic cooking. Then there was that magnificent bubbling of the Goop as as it neared completion. A whoosh of steam followed as you dipped the heated mold into the little water tray to cool it off enough to pry loose the Goopy creation. Who amongst you did not burn themselves on the Thingmaker at least once? Of course we never went to mom for a band-aid. Thingmaker accidents were best kept hush-hush, for the risk of the set being put away for safe keeping, was far too great to gamble upon. I also liked the paper clothing, and the wild neon-colored hair that came with them. 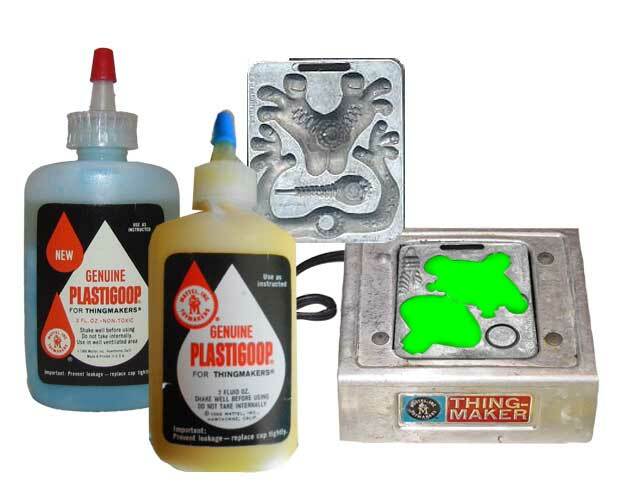 "Plastigoop" was the miracle invention that made up the plasticky DNA of these wonderful Thingmaker items. I remember the bottles and their wonderful colors and fun logos. The nice thing was that the Goop was replaceable, and you could never run out as long as you had the money to replace a bottle or two. The colors were a bit flat, so my favorite color was red. Another cool aspect of this kit was that you could mix the Plastigoop colors to create multi-colored swirl Creeples! It was great to have orange heads with green feet, and have yellow swirls running through them. Mixing blue and yellow goop provided a green middle tone which provided a very unique looking creeple. It was almost like having the first tie-dyed Creeple Peeple. I did have some great fun with this set, and I must have created hundreds of these magnificent plastic peeple. Creeple Peeple were so much fun that they decorated my room along window sills, and anywhere else I had a spare place to stand them up. As writing implements, they made great pencil tops (instead of erasers), but the one place my creeples did not decorate, was school. School was not a great place for these rubberized guys and gals to hang out. They were considered "toys" -the dreaded T word-and were usually confiscated by Teachers-the other dreaded T word. Standing on pencils, these Creeple Peeple didn't seem to last very long. Soon, the pencil point would poke through the bottoms of the creeple feet causing a small hole. With a little boyish manipulation--and the incessant need to fiddle with something it broke--the hole would get bigger until the rubbery feet could be torn in half. I knew what that meant: back to the laboratory to create more Creeple Peeple! The Fright Factory was a severe disappointment; The fact that it was horror-related meant that it should be the coolest set ever, but unfortunately, it wasn't for me. None of the cool scars, fangs, or bulging eyes would stick to the face. Aside from a skeleton or two, there wasn't a whole lot to do with this kit. I eventually invested in the Creepy Crawlers kit too, but it didn't hold my interest either. I guess I was trying to resurrect that feeling I had gotten as a kid collecting rubber bugs from gum ball machines. The one kit that I was really interested in was "Fighting Men", but the stores didn't have any available. I eventually moved on to a life without a Thingmaker, but those Goopy days of the 60's, The Thingmaker, and Creeple Peeple, were among the best I can recall.